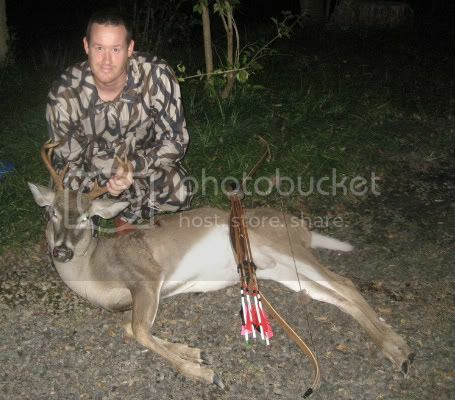 ...Heck, my first deer ever, and I did it with Trad gear. Now for the story. "Dont let whats good, steal you away from whats best"
He's a beaut deer, alright. What bow-and-arrow set-up were you using? Well done and good write up! My set up is as follows. Custom John Mause Lonewolf Kayapo recurve 45#@29 62". CE 150 w/145 Eclipse BH & 30grain adapter, for a total of 175 up front. I still cant believe i had a complete pass through with a 45lb bow, i was going to to take the Wallace 50#'r but it's a good thing i didnt, i dont think i could have held it at full draw for that long..hehehe. Congrats and thanks for the story too ! Good job. Hopefully the first of many. It's great seeing someone come from a non-hunting family take up hunting, especially with trad gear,and then kill a beautiful buck. Nothing like it is there? Congratulations! Congratulations Paul, on your first of many! You picked a very exciting way of doing it, too, a stickbow on the ground. Thanks ya'll. I'm hooked for sure, i can legally take another buck this year in this state and 4 does, so i will seek to fill all my tags...All from the ground. Thank you for all the kind words, i realize he's not the biggest with the best rack..but thats not what i'm about anyway. I love hunting plain and simple. Nice work Paul! I am sure you are hooked now!